Soup! It’s what’s for dinner on these chilly fall evenings. Oh the joys of fall weather. Shorter daylight hours and chilly temperatures are the perfect recipe for sitting down to a hearty bowl of chowder. Any soup would, of course, suffice in this scenario. But chowder just satisfies better. The silky texture of cream, the briny flavor of the shellfish and the aroma of simmering soup all combine to warm not just the stomach, but the heart as well. 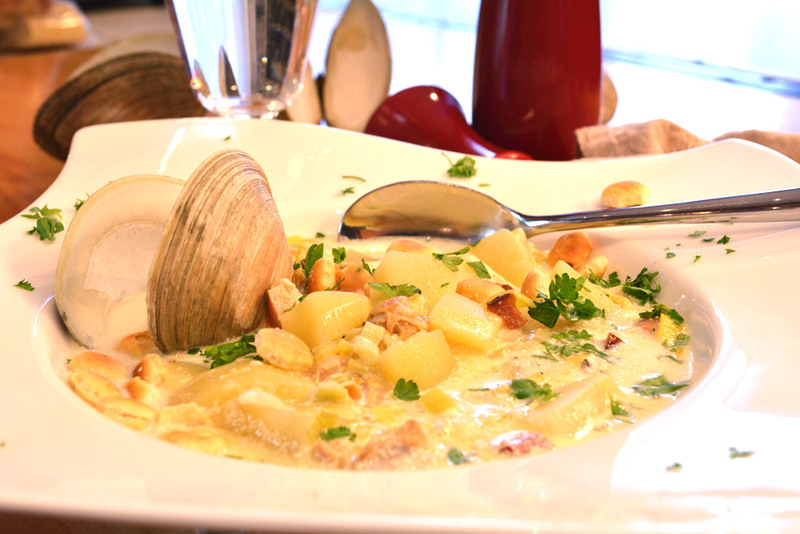 For this chowder, we’ll be using quahog clams, possibly rated “cherrystone” or “top neck” clams. Usually sold by the piece, rather than by the pound, look for medium specimens with tightly closed shells. They’re still alive, so look for clams that are stored in open containers. If you’re fish monger bags your clams in plastic, be sure to keep the bag open so the clams can breathe. You’ve got close to three weeks after harvest to use your clams, but we suggest using them straight away. Like all bivalves, they are sandy and need to be rinsed thoroughly before use. Even after a good rinsing, clams still have sand inside their shells. We’ll be simmering our live clams first and using the resulting broth in the soup, but it will need to be strained through cheesecloth, paper towels or coffee filters before using. For bite-sized seafood such as our clams, we generally use the 2/20 rule. Either cook them for just two minutes, or commit to cooking them for at least 20. Cook them for somewhere between these cook times, and you end up with rubbery seafood. Which is why seafood is usually added just before a soup is to be served, complying with the two minute rule. But we’ll be giving our clams a bit more time in the hot pot. They get a 10-15 minute simmer straight away, and then some additional time simmering merrily away in the chowder itself. The key word in both situations is simmering. Don’t let either the chowder or the broth sit at a rolling boil. It’s not necessary when first cooking the clams, and later it’ll cause the cream to break and become grainy in the pot. After spending your time cleaning, rinsing and cooking this chowder, it’s tempting to just ladle a bowlful into your favorite chowder bowl and dig in. But this chowder definitely improves with age. After this chowder has simmered, the potatoes are tender and the aroma is beckoning, turn the heat off and let it rest for a few hours. Heresy, we know. But trust us, the flavor improves dramatically. When you can no longer wait to eat, reheat the soup to a bare simmer and ladle away. If the cold weather has pushed you indoors, it’s time to start eating fall fare. This clam chowder should be first on your list. In a large dutch oven, cover the clams with 4 cups of water and bring to a gentle simmer. Cover and simmer 10-15 minutes. Discard any clams that do not open after 20 minutes. Remove the clams and rough chop them setting them aside. Discard the shells or keep a few for garnish if you prefer. Strain the broth through a sieve covered with a triple layer of cheesecloth, two paper towels or a coffee filter. Set broth aside. Clean out the dutch oven. In the same pot over medium heat, add the butter and pork. Cook stirring occasionally until much of the fat has rendered and the pork is crisp about 7 minutes. Remove the pork with a slotted spoon and set aside. Add the leeks to the fat and cook until they are tender but not brown, about 4-5 minutes. Add the potatoes and vermouth and cook until the liquid has almost completely evaporated, about 5-6 minutes more. Add enough of the reserved clam broth to just cover the potatoes. Add the fresh spices and bring the broth to a simmer for about 12-15 minutes or until the potatoes are tender. Add the cream, clams, pork, salt and pepper. Bring the chowder to a gentle simmer and then turn off the heat. Remove the thyme and bay leaves. Taste and reseason. Allow the chowder to sit for a couple of hours to age. Bring the chowder back to barely a simmer before serving. Garnish with chopped fresh parsley and serve with oyster crackers.